When we discuss key metrics, either within our own team or with investors, it is important to know which terms mean what. If we don’t understand the nomenclature, then we risk making promises we may have no ability to deliver. Using the form below, try to identify corresponding variables in your own metrics in the fourth column. Measurements that indicate clear actions to be taken. Measurements for the sake of bragging. Measurements that change over time. Those indicators that are common to most every company. Operating based on the behavior of customers. KPIs that drive the behavior of your company based on customer insights. More specific and leading metrics often inquired of by people knowledgeable of businesses like your. Common metrics shared by most companies. Indicates the value you’re creating for your customer and capturing in your business. Measures your ability to scale the business. Your job now is to find the two or three measurable KPIs that matter today. You and your team will then use these KPIs to measure the progress of your business. Finding these KPIs will help you navigate to a place where the business works, to focus your coordinated efforts with a conviction to change, and to develop a company culture that can adapt and commit to new KPIs quickly. Your team’s goal for this exercise is to identify growth and value KPIs by exploring customer experience and metric types. First, replicate the diagram below on a whiteboard or flat wall. Then make sure everyone on your team has blue, yellow, and green sticky notes and a black marker. Second, map what your direct (blue sticky notes) or indirect customers (green sticky notes) experience up to the moment of a transaction. Try to work your way left out from the $$$, going back as many steps as you can to the point before the customer even knows your product exists. Keep in mind that some of the experience points extend past the moment of transaction. Third, use yellow sticky notes to identify and plot the key metrics that show you that you are running a valuable business. These should start to plot closely to the experience points of your customers. Finally, as a team, identify the top two or three growth (customer experience) and value (yellow) KPIs that you and your team can measure and monitor. Take a look at the KPI metrics you chose to measure. Where do they fall on the spectrum below? Tip: go back to the “Know Your Terms” section to help you determine which types of metrics each one represents. 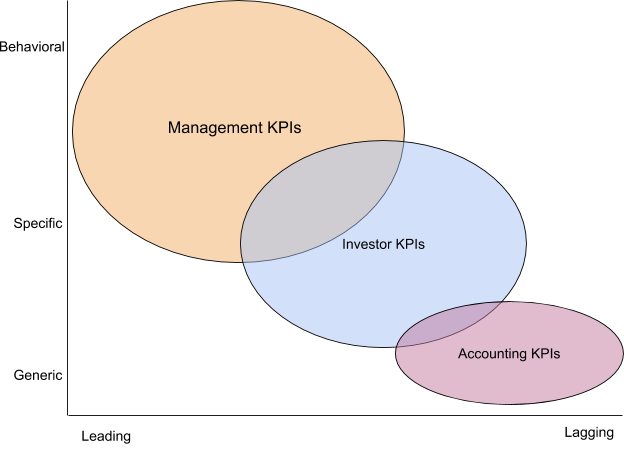 While it’s permissible to have Accounting or Investor KPI metrics, the really exciting growth takes place when we can steer the business with Management KPIs. Once you have identified the Value and Growth KPIs, determine how you will measure these KPIs, ensure someone is monitoring the KPIs, and establish a regular cadence to review your KPIs.